Along the southwest edge of campus, between Campus Drive and Parking Lot 1, is the Guilford Run Bioretention Facility, a beautiful and powerful little native plant garden that is well worth a visit. The garden was constructed to catch and naturally filter rainwater flowing off of a 3.5-acre area of UMD's Parking Lot 1. 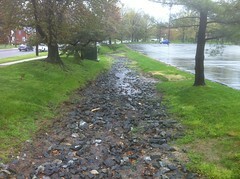 It uses low impact development (LID) techniques to help mitigate pollution of the nearby waterway, Guilford Run, and slow down runoff water to decrease flash flooding and streambank erosion. And, since Guilford Run, and the whole College Park campus, are part of the Anacostia River watershed, the garden will reduce the amount of pollution flowing into the Anacostia River, and eventually the Chesapeake Bay. A campus undergraduate student group, Maryland Sustainability Engineering (MDSE), from the A. James Clark School of Engineering, selected the site (then a grassy swale) and designed, constructed, and planted the garden. Construction took place in January 2011, and planting in April 2011. This was a great opportunity for involved students of many different majors to get real, hands-on experience working on a construction site and see their designs realized. MDSE worked closely with the UMD chapter of Engineers Without Borders, UMD Facilities Management, and faculty in the A. James Clark School of Engineering. The UMD Department of Transportation Services contributed to the much needed parking lot space required for use as implementation staging grounds. Funding for the project came largely from an award of $9,000 from the UMD Campus Green Fund and a Chesapeake Bay Trust Mini Grant award of $5,000. Some of the woody plant material was generously donated to UMD by the Mid-Atlantic Nurserymen’s Trade Show (MANTS). The project leaders for MSE are Brennan Keegan and Phil Sandborn. While the name “Bioretention Facility” reflects the technical side of this garden, the LID engineering aspects are mostly hidden from view. What can be seen is an aesthetically pleasing garden of woody and herbaceous plants native to our area and specially selected to withstand periodic inundation. Woody species include Virginia sweetspire (Itea virginica), red-twig dogwood (Cornus sericea), summersweet (Clethra alnifolia), american beautyberry (callicarpa americana), black chokeberry (Photinia melanocarpa), bayberry (Morella pensylvanica), wax myrtle (Morella cerifera), winterberry (Ilex verticillata), inkberry (Ilex glabra), and river birch (Betula nigra). Herbaceous species include red columbine (Aquilegia canadensis), woodland phlox (Phlox divaricata), black-eyed susan (Rudbeckia hirta), sweetscented joe pye weed (Eupatorium purpureum), goldenrod (Solidago canadensis), Virginia wildrye (Elymus virginicus), switchgrass (Panicum virgatum), big bluestem (Andropogon gerardii), and a raingarden wildflower seed mix to fill in for the first year and keep weeds down.